When it comes to indoor flowers and plant growth I am known to have a black thumb. I can't even keep the cactus alive indoors. For me, silk plants work really well around the home and office. People may think fake plants won't look good but they do blend in nicely. My husband took them to work and put them around his office. His coworkers and clients always compliment him on how calming his office is and a place of serenity. The orchids look real from a far. I think they give it a nice touch. He tried putting them in different locations. Here they are next to another "fake" plant. I like when he has them spread out. We thought the water feature was cool too. The water looks real! These orchids came in a set of 4. You can find them here. Silk Plants Direct has a wide range of flowers, plants, and trees. They even have wedding floral arrangements. You could use this as decoration. They make great gifts for us black thumb people. They also sell containers. If you get separate stems you could mix and match and put them into fancy containers to put around your home. 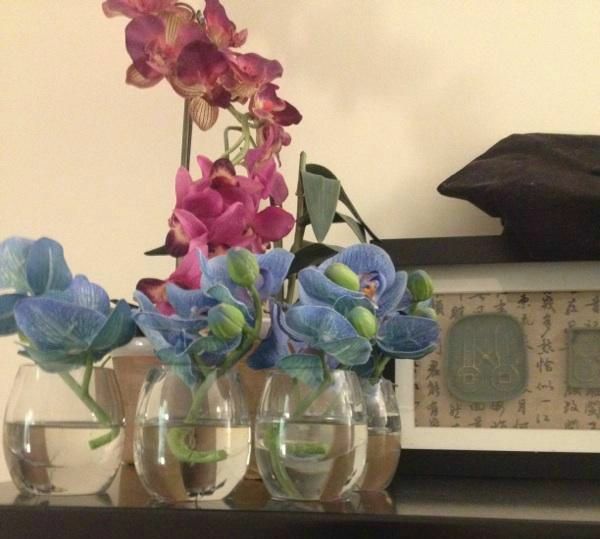 We were very pleased with Silk Plants Direct and would buy other decor from them. Have you ever decorated with Silk plants before? Would you try using them in your home?